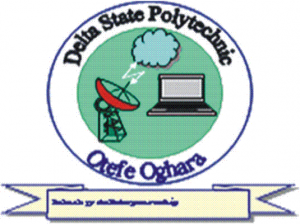 Delta State Polytechnic, Otefe-Oghara is inviting all the qualified candidates to her National Diploma (ND) programme for 2017/2018 academic session. (i) Five(5) O’Level Credit Passes including Mathematics and English Language in subjects relevant to the Candidate’s course of study. (ii) The following subjects are taken as one: Economics or Commerce, Government or History or Civic Education, Biology or Agricultural Science or Fishery or Animal Husbandry, Marketing or Salesmanship, Financial Accounting or Book Keeping, Data Processing or ICT or Computer Studies or Information & Communication Technology. CRS is accepted only for all Business/Social Science Courses. (iii) Candidates who applied for Computer Science must have at least a pass in Physics. (i) All Candidates who chose Delta State Polytechnic, Otefe-Oghara as their first or second choice and scored 180 and above in the 2017 UTME. (ii) Candidates who chose other Polytechnic but wish to change to Delta State Polytechnic, Otefe-Oghara and scored a minimum of 180 having changed it through JAMB.